Reading books will be sent home with your child to be read every night. It is very important that the children read regularly as this helps them to become more fluent and competent readers as well as help to build an amazing bank of vocabulary. 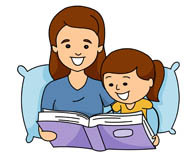 Books will be changed on Mondays if it has been recorded into the reading record that the child has completed the book. If you are interested in sharing more books with your child why not visit out ‘Story Time’ section on our website.